I bought these shorts on the Oporto Flea Market on the first time I went to one, a few years ago. For some months I sold and bought a lot of things on this type of events, it's so cool to find unique pieces for low prieces, if you live in Oporto you should visit it. I kept the rest of the outfit really simple and added this Matilda necklace, which I'm in love with. Comprei estes calções no Flea Market do Porto na primeira vez que visitei este evento, há alguns anos atrás. Durante alguns meses cheguei a comprar e vender roupa neste tipo de eventos, é óptimo quando se encontram peças únicas a preços muito acessíveis. Se viverem no Porto deviam mesmo visitar. O resto do outfit é bastante simples, pus este colar lindo da Matilda como único acessório. Muito gira! 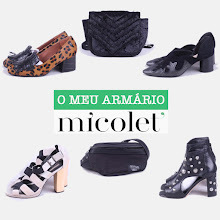 Gostei imenso dos sapatos e da blusa! Super cute outfit! love the top!!! The necklace really is perfect and so is the rest of the outfit - you look perfect, girl :)!